You're not going to use beauty products that do your hair, nails and skin more harm than good. Or are you? It turns out most commercial products intended to make us look and feel better are filled with chemical ingredients that often cause more damage than they prevent. Of course, this should come as no surprise considering the beauty industry uses more than 5,000 synthetic chemicals! And though you may not be exposed to them all at once, it is estimated the average American is exposed to 126 cosmetic chemicals every single day. There would be less cause for concern if these chemicals were all proven safe. On the contrary, the FDA does not require beauty product manufacturers to prove the safety of their products or ingredients. Yes, once an ingredient is proven dangerous it is often banned, however, it may be some time before evidence of negative health consequences emerge. And often products banned in other countries are still widely used in the U.S. In other words, we are at the mercy of companies often more concerned with their bottom line than ensuring the health of their customers. Beyond the personal health of those using these products, shampoos, hair color, and other chemical concoctions are washed down the drain and ultimately sent to our rivers and streams. Certainly they pass through our sewage treatment plants, but these processes cannot break down all synthetic materials, thus contaminating the earth and ultimately our bodies through our drinking water. 1, 4-Dioxane - If you see a product with sodium laureth sulfate or "PEG," "-xynol," "ceteareth," "oleth" and other ethoxylated "eth" references, you need to worry about dioxane (a possible carcinogen) as it is a contaminant associated wtih all of these ingredients. Antibacterials - Certainly you want to kill germs on your hands and body, but plain soap and water are generally strong enough. You don't need antibacterial soap, lotions or gels. In fact, overusing these products can make it even harder for your body to fight off bacteria. Coal tar - This proven carcinogen is a common ingredient in anti-itch creams and dandruff shampoos, as well as mouthwash in the form of FD&C Blue 1 and FD&C Green 3. Diethanolamine (DEA) - Used in soaps and shampoos to create the lathering effect we associate with clean, DEA has not been proven carcinogenic on its own but can become so when mixed with other chemical ingredients. Dioxin - This is a dangerous by-product of the chlorine bleaching of rayon used in tampons. Formaldehyde - Yes, formaldehyde! It's a common ingredient in a number of beauty products, often as a contaminant or break-down product of diazolidinyl urea, imidazolidinyl urea and quaternium compounds. Hydroquinone - Though banned in other countries, including the European Union, hydroquinone is still used in products sold in the U.S. Used in skin lighteners and some moisturizers, this chemical is neurotoxic and allergenic, and has been shown in some studies to cause cancer. Fragrance - It sounds innocent enough, even natural, yet nothing could be further from the truth. When a beauty product lists "fragrance" among its ingredients, it probably includes chemical pthalates used to preserve aromas. Lead - This neurotoxic is a naturally-occurring contaminant of hydrated silica which is used in toothpaste. Mercury - Thimerosol is an ingredient used in some mascaras. Unfortunately, it contains mercury which as been linked to brain damage. Nanoparticles - To make sunscreen transparent, manufacturers use zinc oxide and titanium dioxide nanoparticles. Unfortunately, these nanoparticles can easily aborb into the pores of your skin which has been linked to brain cell damage. Parabens - These chemicals are common preservatives in beauty products, though they are linked to reproductive problems and breast cancer. Petroleum distillates - These may also be labeled as petroleum or paraffin, all of which may be carcinogenic. P-Phenylenediamine (PPD) - Linked to problems with the nervous and respiratory systems, PPDs are commonly found in hair dyes. Pthalates - Used in the "fragrance" we find in most conventional beauty products, pthalates have been shown to cause cancer and reproductive disorders. Sodium Lauryl Sulfate (SLS) and Sodium Laureth Sulfabnh zxte (SLES) - These chemicals are common foaming ingredients for soaps and shampoos. Not only are they skin irritants, but they can pass through the skin and into the liver, brain and heart. Toluene - Linked to dizziness, headaches and nervous system problems, toluene is a common ingredient in hair dye and nail polish. It can also lead to birth defects and miscarriage, thus the warning to avoid dying your hair when you're pregnant. Triethanolamine (TEA) - Your eyes, hair and skin can be irritated by TEA, an ingredient commonly used to balance pH. After long-term exposure, TEA has been shown to be toxic. Volatile Organic Compounds (VOC's) - These dangerous substances are found in beauty products ranging from nail polish remover to cologne. Of all the beauty product manufacturers you have to choose from, below is a list of what our research shows to be among the most trusted. Note, not all of each company's products may be completely organic. As with any product, read the ingredients to ensure it meets all of your criteria. If you cannot find ingredient lists online, or details seem unclear, do not hesitate to email or call these companies with your questions. There are a number of natural products you may already have at home that you can easily and affordably add to your beauty regimen. This is by no means an exhaustive list, but it represents the basics and is a good place to start. 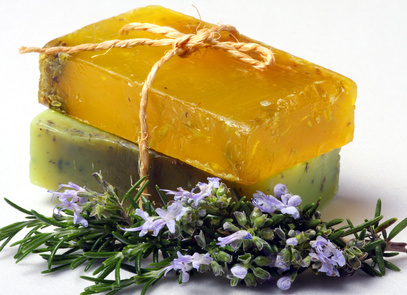 Olive oil, almond oil, grapeseed oil or jojoba oil as moisturizer for hair, nails and skin. Castor oil, as a lip balm. Lavendar essential oil, as a fragrance you can add to your bath water or use with a carrier oil (like Jojoba) as a fragrant moisturizer for the skin. 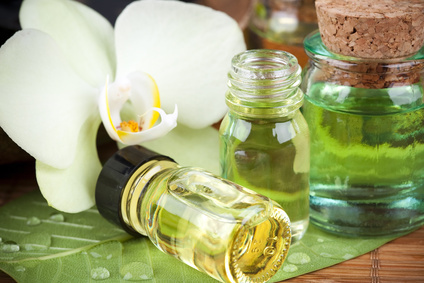 Tea tree essential oil, for treating acne. Vitamin E oil, for lightening scars. Witch hazel, as a toner. Apple cider vinegar, as a hair rinse to treat dandruff. Lemon juice or vinegar, for fading sun spots. 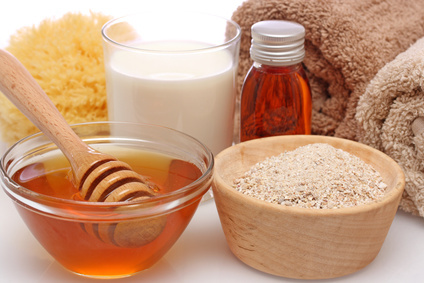 Baking soda, sugar, salt or oatmeal mixed with oil (olive, almond, grapeseed, jojoba) as a moisturizing exfoliant. Avocado or banana, mixed with lemon juice as a brightening, moisturizing mask. Aloe vera, for sunburn relief. Epsom salt or Dead Sea salt, added to bath water to relax muscles and release toxins in the body. Beyond these simple explanations for how to use common household ingredients as beauty products, you can create more elaborate concoctions. See the Homemade Beauty Recipes linked to in the Sources below.